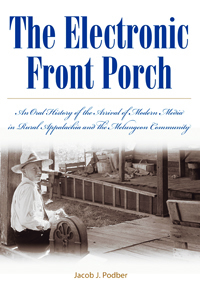 Using oral histories, The Electronic Front Porch takes a revealing look at the impact of radio, television, and the Internet on the residents of rural Appalachia. Eighty-six of those residents provide a human diary documenting how early listeners and viewers chose, listened, and watched their programs, and perhaps most importantly, how electronic media affected their lives. The stories tracing the adoption of the Internet show how Melungeons, who historically have been perceived as “other,” used electronic media to establish communities despite their geographical isolation. These interviewees described how radio’s arrival encouraged socializing and community in rural areas. TV’s “hillbilly” stereotypes caused some participants shame, but others found pride in their inclusion in TV culture. Melungeons tracing genealogy on the Internet found a way to redefine their identity through contact with each other on the Internet. In telling their stories, the participants raised complex issues of community, ethnicity, gender, and identity. By weaving together theories and methodologies from a variety of disciplines this study creates a multilayered context for understanding the significance of these oral histories in the study of American popular culture. Recipient of the 2008 Ray and Pat Browne Literary Book Award for the Best Focused Study from the Popular Culture Association/American Culture Association. Awarded third prize from the Appalachian Book of the Year Awards.